In the decade following the end of the Civil War the Upper East Side experienced rapid development. Among the most prolific architects in the area was John Sexton, who designed scores of brownstone-fronted rowhouses. In 1872 he embarked on an ambitious project for developer Christopher Keyes on East 69th Street between Park and Lexington Avenues. Completed the following year, the eleven identical high-stoop residences were 20-feet side and intended for financially-comfortable buyers. Keyes priced them at $30,000 each, or about $635,000 today. The family of well-to-do lawyer Gilbert Sutphen Van Pelt would call No. 121 home. Van Pelt had married Annie Powell on June 17, 1863. Gilbert was a member of the Holland Society, composed of descendants of New Amsterdam, and Annie was a Daughter of the American Revolution. The couple would have two sons, Frederick Gilbert and William Robinson. By the first years of the 1890's Frederick had moved to California with his wife and daughter, named Annie, after her grandmother. Frederick's life was not a happy one. Early in June 1893 he came east to visit the family for a week. His mother described him during the visit as "very cheerful then and in good health, except for a severe cold that made him very nervous." His nervousness, however, most likely did not come from a cold but from addiction. Two weeks after he returned to San Francisco the 27-year old was dead. On June 28, 1893 The Evening Post reported "Frederick G. Van Pelt, son of G. S. Van Pelt, a prominent jurist of New York, died yesterday from having taken thirty ounces of chloroform. He had been addicted to the use of chloroform as an intoxicant." The Van Pelts had received a telegram on the night of his death. Annie hinted to a reporter from The Evening World that her daughter-in-law was responsible for Frederick's problems. When asked if she had accompanied him on his recent trip, Annie replied "No; his wife was not with him here. I do not know her. My son's life has been a very sad one. He made a great mistake, as many young men have done." Gilbert Sutphen Van Pelt died on November 11, 1906 at the age of 69. 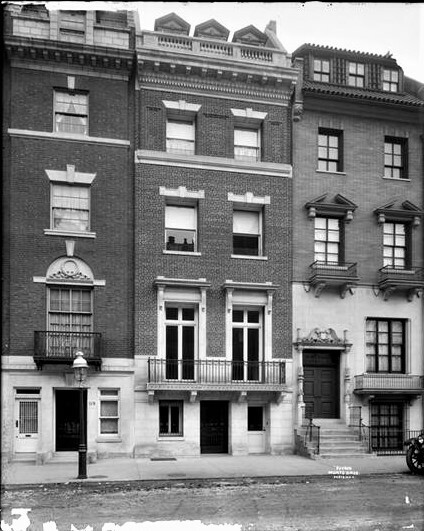 Annie remained in the 69th Street house and it was around this time that Frederick's teen-aged daughter moved in with her. The entrance doors of the Van Pelt house were graced with bronze doorknobs executed by famous French sculptor Jean-Léon Gérôme. They had been brought from Paris as a gift from Annie's father. On the morning of February 15, 1907 Annie was horrified to find them missing. The New York Times reported "Mrs. Van Pelt believes the thieves do not know the real value of the doorknobs and will sell them for junk." The article added "Mrs. Van Pelt, however, will give a great deal for the return of the bronzes, because, aside from their value as specimens of the work of the great French painter and sculptor, they have the especial value of association, having been brought from Europe by her father." It is unclear if Annie ever recovered her doorknobs. Annie died on May 16, 1909 at the age of 68. She left an estate of more than $3.3 million in today's dollars. She left $500 to each of her servants, a generous $14,000 today. The New York Times reported that the bulk of the estate was died equally between her son, William, and her granddaughter, Annie. The teen's portion was held in trust. The following April Annie's estate placed the house on the market. Described as a "handsome four story, basement, and cellar brownstone (high stoop) dwelling," it was purchased by Catherine S. Auchincloss on May 6 for $59,500. Catherine and her husband, Edgar. S. Auchinclose, had lived next door at No. 123 since 1905. In September 1909 Catherine hired the architectural firm of R. H. Robertson & Sons to make "extensive alterations and additions" to the home. The brownstone front and stoop were removed, replaced by a fashionable neo-Georgian brick and stone facade. The entrance was now firmly on the sidewalk. A stone balcony with iron railings fronted French doors at the second floor, or piano nobile, where the dining room and drawing rooms were situated. Paneled lintels at the third floor and splayed lintels at the fourth contributed to the 18th century design. A dormered mansard was slightly disguised by a stone balustrade above the bracketed cornice. Agnew's family on his father's side first arrived in Philadelphia in 1786. His mother, Mary Hervey Bliss, traced her American roots to Thomas Bliss who settled in Braintree, Massachusetts in 1635. 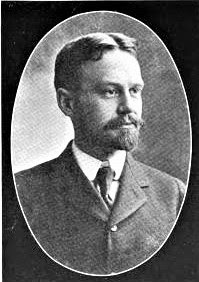 Born in 1868, George graduated from Princeton College in 1891. He entered the Wall Street firm of Cuyler, Morgan & Co. Rather floridly, in 1902 The Successful American said "Soon after his graduation he surrendered the allurements of a professional life for the desk of the counting-room, and his life, so far, has been devoted mainly to financial and commercial pursuits, in which he has displayed remarkable vigor, together with integrity of character, perseverance and shrewd business tact." But by the time Agnew moved his family into No. 121 his devotion to commerce had given way to political pursuits. He was a member of the New York State Assembly from 1903 through 1906 and a member of the New York State Senate from 1907 to 1910. Agnew and his wife, the former Emily D. Gruban, were married in 1908. They had four sons, George, Jr., A. Gifford, Charles D., and David P., and a daughter, Madelaine. George's wide-spread business interests included directorships in the Mexican Northern Railway, Robbins Conveying Belt Company, Intertype Corporation, and the Erie & Kalamazzo Railroad. He was heavily involved in mining and was president of the North Star Mines of California, and a director of the Phelps Dodge Corporation, the Empire Star Mines and Compania Metalurgica Mexicana, and the president of the Gauley Mountain Coal Company of West Virginia. The Agnews' country home was in Westchester County, in South Salem. It was in the Presbyterian Church there that Madelaine's wedding to Hastings Foot 2nd took place on September 17, 1938. The bride had enjoyed a privileged youth, attending the exclusive Spencer School and then Sarah Lawrence College. Her marriage ceremony did not fall short. There were 22 people in the wedding party. A reception in the Agnew summer home followed. After an illness of only a few days, the 73-year old George B. Agnew died in the East 69th Street house on June 21, 1941. The former senator's funeral was held in the Fifth Avenue Presbyterian Church where he had worshiped for for nearly six decades. Agnew's will left generous amounts to charitable, educational and religious institutions. Princeton, for example, received $25,000 (more than $410,000 today). Emily inherited the house and its furnishings. George had put aside $5,000 to be distributed among the servants by Emily. Emily's period of mourning was interrupted just three months later when George, Jr. married Mary Althea Eldredge in a surprisingly elaborate ceremony in Glen Cove, Long Island. Emily died on July 9, 1947. No. 121 became home to the Lebanese Consulate General that year. Four years later it was converted to a doctor's office and two duplex apartments. The Agnew house continues to have just two apartments inside. And from the street little has changed since a new widow gave it a major face lift in 1910.